Tesla finally introduces its next level of electric vehicle charging — Supercharger V3 — this new Tesla technology can currently add 75 miles to a Model 3 in just 5 minutes, according to the automaker’s analysis V3 Supercharging will reduce the average charging time to 15 mins. Currently, only Tesla Model 3 owners participating in the Tesla Early Access Program can use the Supercharger V3 charging since the technology is still in ‘beta’. Model S and X owners will be abe to use the technology with an over-the-air software update estimated to deploy in the next few months. Supercharger V3 technology is under development for at least a couple of years now and has been teased by the CEO Elon Musk from time to time, with the charging rate/peak power output of 250 kW, this is the fastest EV charging solution in the world right now. Tesla just released a teaser video showing a Tesla Model 3 being charged via the Supercharger V3, demonstrating that the latest charging tech by Tesla can add the range of up to 1,000 miles-per-hour — ‘range anxiety’ is a thing of the past now. 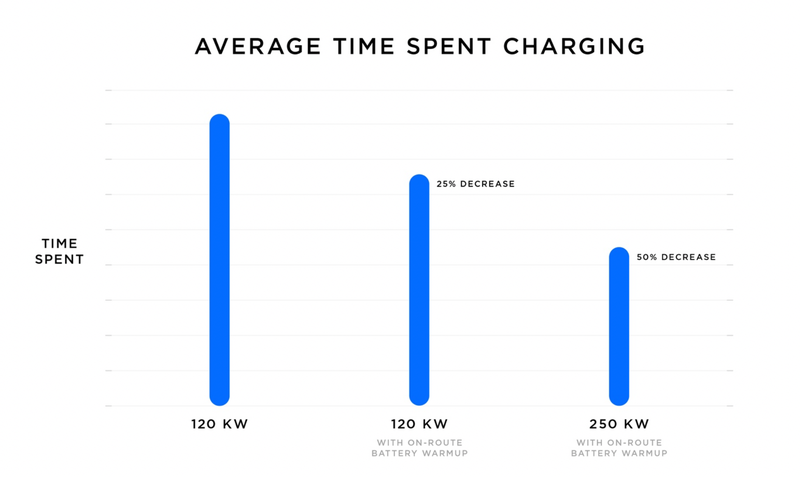 When you’re navigating to a Supercharging station your Tesla vehicle (with V3 enabled) will pre-condition/warm-up your batteries to absorb maximum packs of electrons possible — according to Tesla this pre-conditioning accelerates the charging process up to 25% faster on the legacy V2 Superchargers (comparison chart by Tesla below). On-route battery warm-up coupled with the V3 Supercharging drops the charging time up to 50%, that’s fast. Average time spent charging with on-route warm-up for V2 and V3 Supercharging. Graph by: Tesla Inc.
Tesla is even increasing/unlocking the existing 12,000+ V2 Superchargers around the globe to 145 kW but it’s unclear from their V3 blog post if this is per car charging rate or per stall (Tesla blog post in full below). This is great news for the Tesla and EV community as the V3 Superchargers proliferate the remaining concerns about the ‘range anxiety’ will be totally taken care of — if you are able to charge your vehicle up to 80% in 10-15 mins, this will be very close to topping up gas in an ICE vehicle.